Danish Constitution Day Reception - Summer Party yearly hosted by the Ambassador of Royal Danmark to Latvia. A yearly big celebration for all Danes living in Latvia. Annual General Meeting, for members only. SOLD OUT! 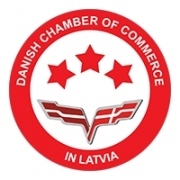 The Danish Chamber of Commerce in Latvia together with the Finnish, Norwegian and Swedish Chambers of Commerce cordially invites you to join a business luncheon with the new Minister of Justice, Mr. Jānis Bordāns (The New Conservative Party - Jauna konservatīvā partija), at the Radisson Blu Ridzene Hotel (Reimersa iela 1, Rīga) on Wednesday, March 6, at 13:00. Registration and networking from 12:30. Recorded conversations at Ridzene Hotel between 2009 and 2011 exposed potential large scale corruption schemes and trading with power and influence in Latvia involving various government officials and private business owners. Mr. Bordāns run in the last Parliamentary elections was partly based on combating exactly such illegal behavior, with his party’s campaign platform that was focused on strengthening the rule of law, fighting corruption, and reforming the insolvency process in Latvia. Now Mr. Bordāns is pushing for an independent review of the Latvian judicial system, in order to increase transparency and decrease corruption.